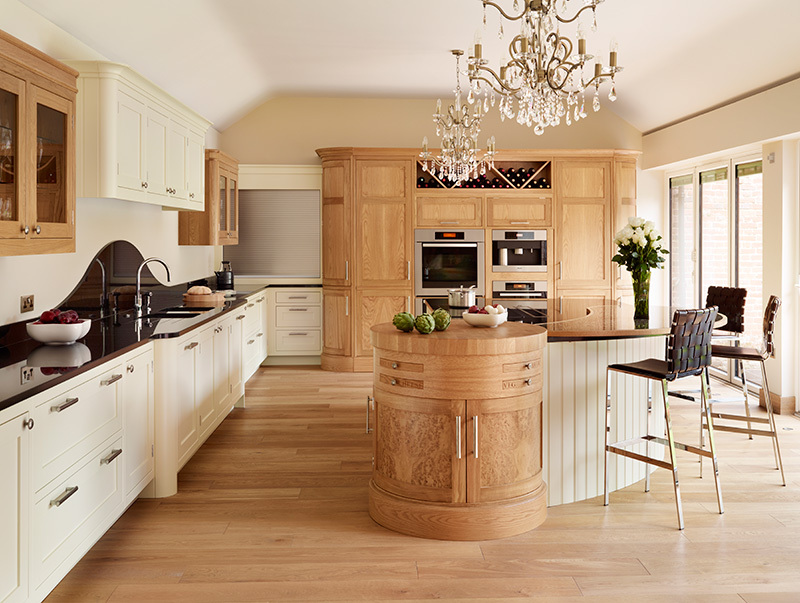 Davonport specialises in creating beautiful, bespoke designs and handmade furniture solutions; here are some inspirational ideas for different ways to incorporate gorgeous curves into your kitchen. Whilst visually stunning, a curved cabinet will generally provide less storage space than a square cabinet. 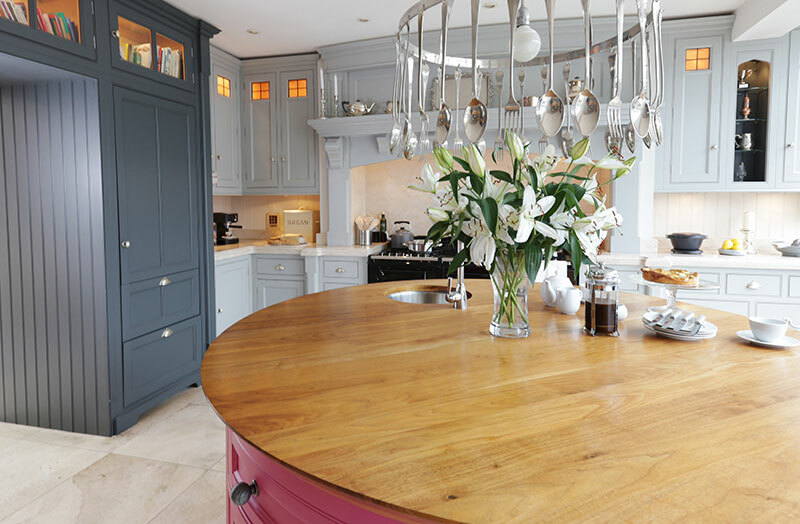 However, you could work a circular cupboard into your kitchen island – such as the Davonport circular chopping block cabinet. This impressive cabinet can feature a full circle carousel inside which means you can have a cupboard which is beautiful to look at, without compromising on practicality. A curved cabinet, specifically the circular chopping block cabinet, is a good opportunity to add an accent colour or finish to the design. If your kitchen has a painted finish, using oak or walnut for the chopping block cabinet can emphasise its impact in the room. 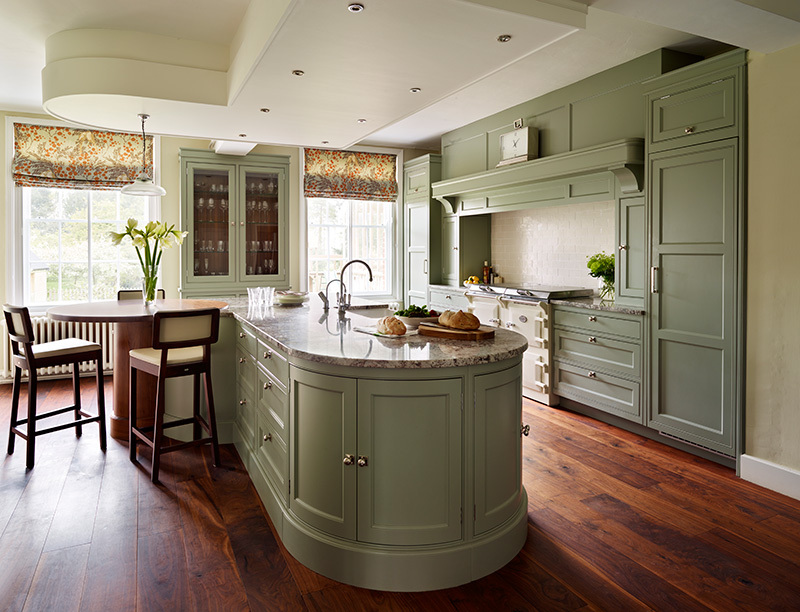 Alternatively you could paint the curves a different shade or contrasting colour to the rest of the kitchen. If you’ve got a good amount of space, a curved kitchen island will create the wow factor like no other element in the room. 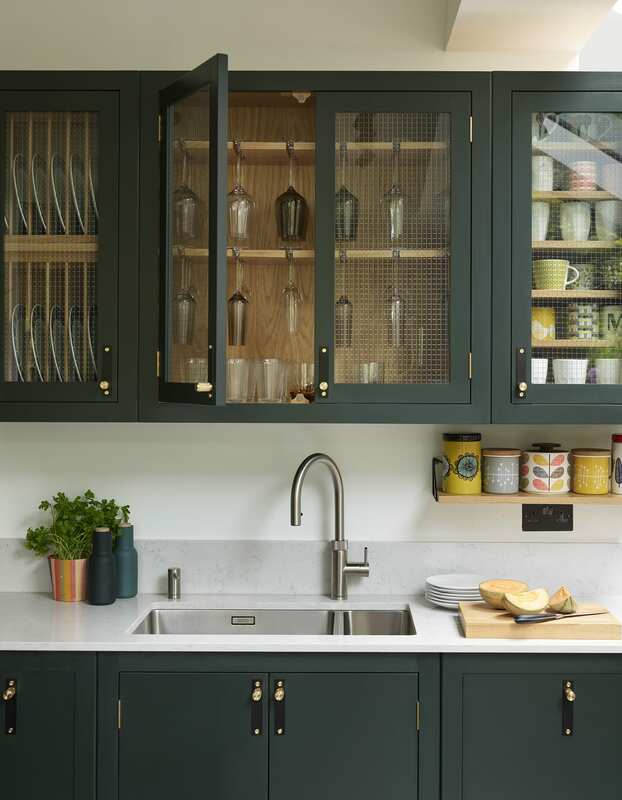 Curved cabinets also work really well in high footfall areas, such as on the end of a base run on a busy route around the kitchen as there are no awkward angles for members of the household to navigate around or corner to get stuck in. Curved worksurfaces can be a subtle way of adding curves into a kitchen design, softening rigid lines yet retaining usable space. In addition, it can be a really nice touch in a family home, especially for those with young children, where sharp corners could potentially be less desirable. If your kitchen has curved cabinetry then it is a good idea to incorporate these curves throughout the rest of the room to echo your cupboards. With a few simple tricks you can use small details to create a big impact. For example, you could use a rounded splash back or a curved tap; this mirrors the curved cabinet details which helps unite different aspects of the room. Curved kitchen cabinets are visually stunning, but they also need to serve the purpose of storing food and appliances that can be easily accessed. 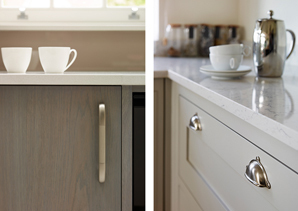 Opt for vertical handles or single knobs on curved doors for seamless integration that is both practical and elegant. 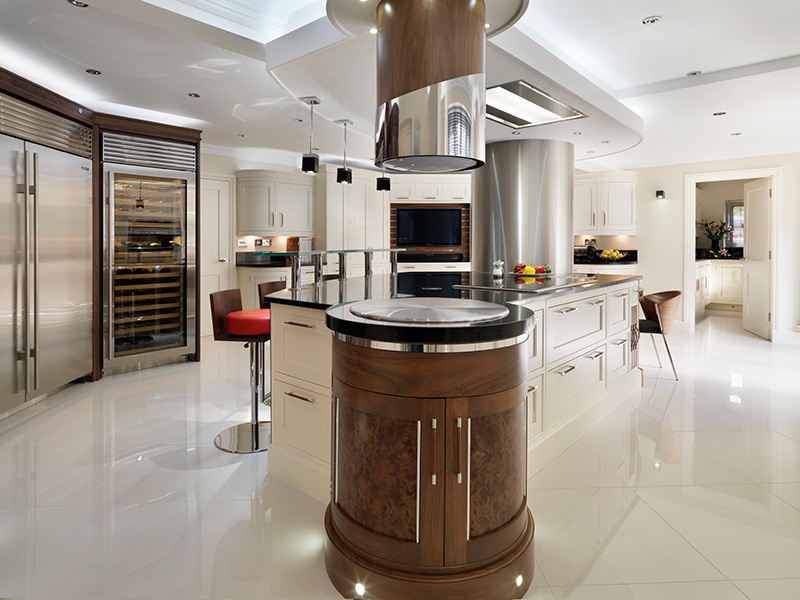 A curved cabinet can be incorporated in so many ways that they can feature in almost any kitchen design. Whether your preferred style is traditional country or sleek modern there are curved features that will suit any room. 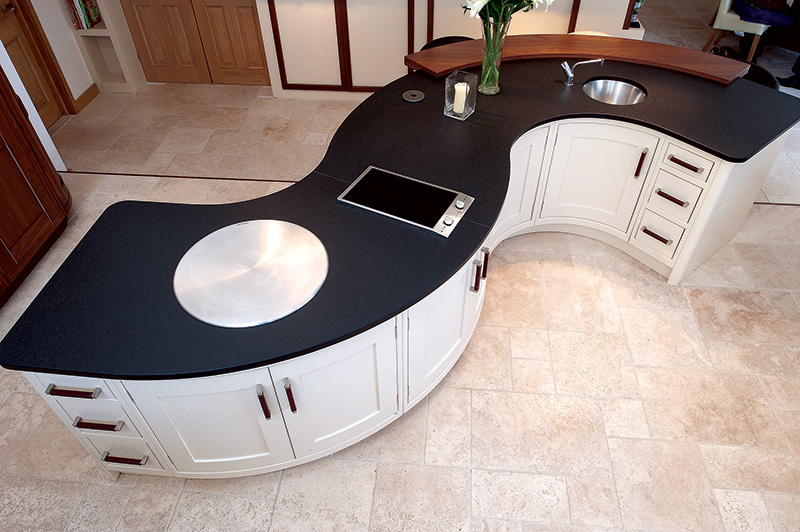 If you would like to find out more about how you can incorporate curves into your kitchen, please contact us.